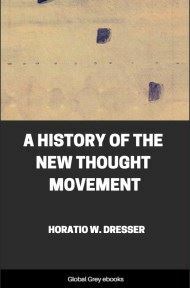 Chapters include: The New Age; Quimby The Pioneer; Quimby's Method Of Healing; The First Author; The Beginnings Of Christian Science; The Mental Science Period; The New Thought; The First Organizations; The First Conventions; The International New Thought Alliance; Other Organizations; The Movement In Foreign Lands; Looking Forward; and, Kindred Movements. Again, we called attention to the nineteenth century with great pride as the age of the philosophy of evolution. We put our hopes in that philosophy. We expected it to explain the great mysteries. We wrote history anew, we issued new textbooks, and in a thousand ways adapted our thought to the great idea of gradual development. But while the new philosophy accomplished wonders for us in so far as it showed the reign of law, the uniformity of nature, the immanence of all causality, it deprived us of our former belief in the divine purpose. Taken literally, it led us to regard nature as self-operative. We had to work our way back to the divine providence. We realized that evolutionism was simply a new form of materialism. We carried forward from the nineteenth century into the twentieth many great problems of life and mind not yet solved. The philosophy of evolution has come to stay, but not even in the form of Bergson's interpretation is it satisfactory. We also looked upon the nineteenth century as the period of development of idealism. The modern movement, beginning in Germany, spread to England and the United States, and we witnessed a most interesting form of it in our transcendentalism. This movement, in brief, emphasized Thought as the cardinal principle. It sought to explain all things by reference to this Thought. It found the starting-point as well as the meaning in the Idea. The outward world was regarded as a mere phenomenon in comparison. This movement had permanent contributions to make to our thought. We associate the name of Emerson with its spiritual meanings. 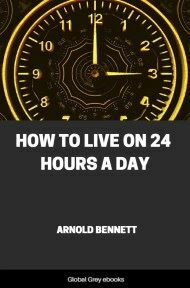 But most of its theoretical teachings seem far removed from our practical thought today. We no longer try to spin the world out of the mere web of Thought. We need a new idealism to replace that of Fichte and Hegel. We are suspicious of mere speculation. The idealism of the last century is already mere matter of history. The nineteenth century was also the epoch of religious liberalism. Throughout the century Unitarianism accomplished a great work. The liberalizing tendencies spread into all denominations. We take many ideas as matters of course nowadays for which the great leaders of the time of Theodore Parker and James Mar-tineau had to contend at the risk of intellectual martyrdom. The liberalism of the early part of the century had a destructive work to do before the freer thought of the day could assimilate the teachings of modern science and give us our present constructive faith. 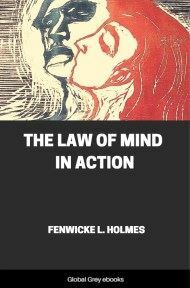 It requires decided effort on our part today to put ourselves back to the time when narrowing dogmas still ruled the human mind, when it was customary to pray for divine intervention, to believe in miracles as infractions of law, and to draw lines of rigid exclusiveness around the ecclesiastical sect to which one happened to belong. The history of liberalism is so comprehensive that it is always a question nowadays what we mean when we use the term. To be liberal is to be of the new age. The real question is, what is the goal of liberalism? 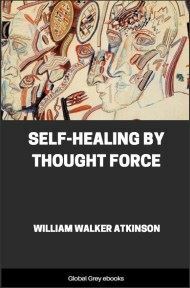 The answer which a disciple of the New Thought would give should be understood in the light of a long struggle for the right to employ mental healing, a struggle which went on almost apart, independently of the warfare waged by Unitarianism upon the old doctrines and dogmas.